Both of my maternal grandparents were workers in New York City’s bustling, and commonly exploitive, garment industry. I never knew much about it, beyond the bare facts that my grandfather was a “presser”, and my grandmother was a machine operator, and that they’d met at work. But I’ve always wondered what that part of their daily lives was like, and what conditions were like in “the shop”. 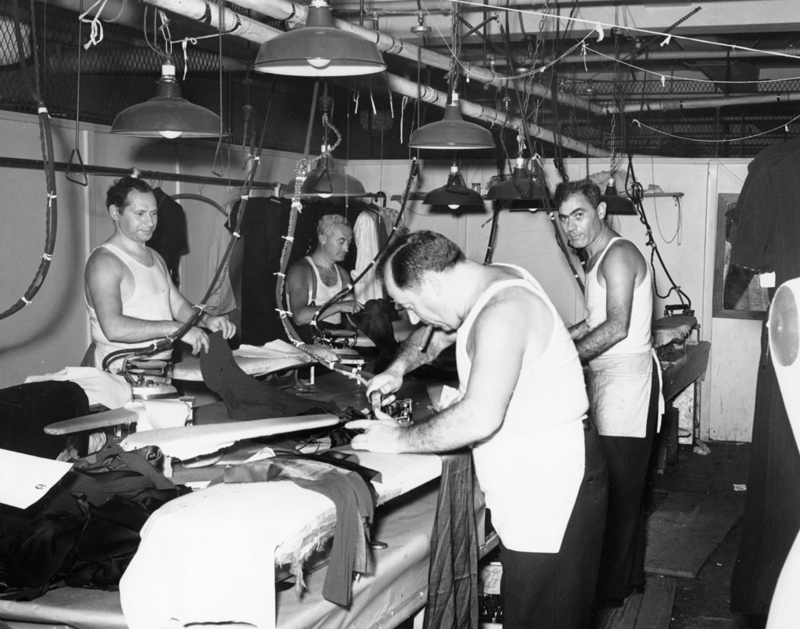 Manhattan’s garment district actually has its origins in the early 1800s. Southern plantation owners, reluctant to allow their slaves to take the time to make their own clothing, created a demand for mass produced clothing to outfit the slaves. Ironically, the industry got another boost in the mid-1800s, churning out uniforms for the Union Army. In the years following the Civil War, many more Americans were likely to purchase their clothing already made rather than sew their own things, and the garment industry took off. Manhattan seemed to be its hub, with about 70% of women’s clothing and 40% of men’s clothing coming from New York City by 1910. So how did Mary and Sal fit into this picture? It’s a sad pattern that is still in existence today; affordable, mass produced clothing depends on a steady supply of cheap labor. It was a “perfect storm” of circumstances, really…In the early 1900s the Garment District occupied (and still occupies) an area in Midtown Manhattan, just south of Central Park. During this time period, literally millions of southern European immigrants poured into Manhattan, embarking from Ellis Island, many of them settling in the notorious tenement apartments on the city’s Lower East Side. Their proximity to the Garment District meant a logical marriage between a burgeoning industry in need of cheap labor and an army of people desperate for work of any kind. Most garment workers did not work directly for the clothing manufacturer. Instead, they worked for contractors – the middlemen between those whose name appeared on the label and those who actually pieced together the clothing. Envision the production of a dress, at a large scale shop, run by a contractor and his foremen. The work took place in assembly line fashion, with different groups handling different phases of the process. There were “cutters”, who would cut through several layers of fabric at a time, using a large cutting tool resembling a jigsaw. Then “basters” would quickly baste the pieces of the dress together, before handing them off to the “machine operators”, who would sew the pieces together. The “finishers” would hand-sew the detailed parts of the dress on after the dress was sewn together. Finally there were the “pressers”, who would basically press, or iron, the finished dress. Conditions in most shops were not ideal, with long hours and meager pay being the norm. Many times the contractors and foremen themselves were from the same country as the workers they exploited. It was easy for them to recruit workers that they could relate to and converse with in their native languages. In some cases, the contractors would actually set up small shops directly in the tenement apartments. Most immigrants were probably more than happy to take the work. My grandmother Mary lived in a tenement apartment on Elizabeth Street, on the Lower East Side of Manhattan. (A story for another day.) Her mother Carmela took in “home work”, sewing the hems of men’s trousers from their apartment. My grandmother was not allowed to leave for school in the morning until she had helped her mother stitch her way through the pile of trousers that needed to be completed for that day. Mary herself later became a sewing machine operator. On the 1930 Federal Census she is listed as an “machine operator at a dress factory”. My grandfather Sal was a presser, and various brothers in the family were cutters. I’m not sure exactly what year Mary and Sal met, but fate had put them together at the same shop. In spite of the chaos I’m assuming was going on in their work environment, they’d somehow made eye contact, and the rest was history. According to family legend, Sal would wink at her whenever he passed her machine. They were married by 1935. Three years later my mother was born, and Mary left the workforce for many years (although she never stopped sewing). Sal, however, continued to work as a presser for the next 35 years or so, until he retired in the late 1960s. I never cease to be amazed that he managed to own his home on Long Island and support a wife and two daughters on his salary. But somehow he’d done it.